GIVE HAM FOR THE HOLIDAYS! 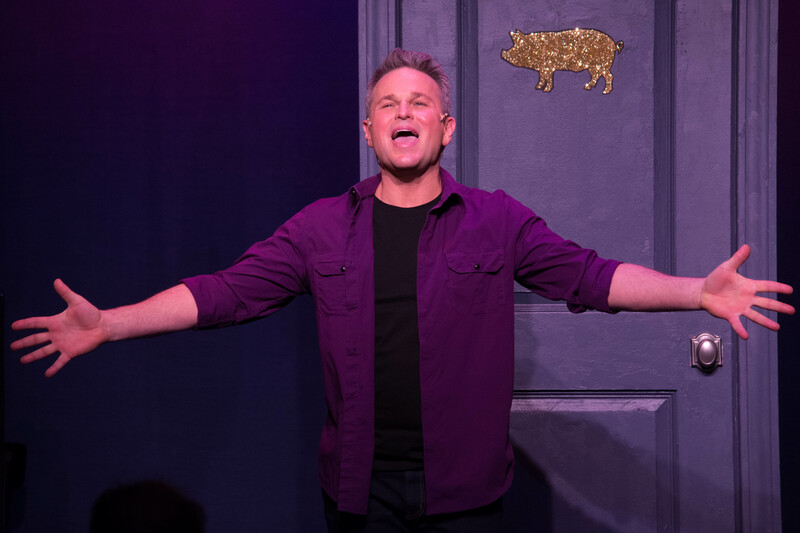 Direct from a critically acclaimed off-Broadway run, HAM: A Musical Memoir will make its West Coast debut at the Los Angeles LGBT Center’s Renberg Theatre with previews beginning January 21 and opening night set for Saturday, January 23. HAM: A Musical Memoir will play a strictly limited engagement through February 7. Tickets to HAM are the perfect holiday gift. Through December 31, a $5 discount (per ticket) is available online at lalgbtcenter.org/theatre or by calling (323) 860-7300. Based on Harris’s book HAM: Slices of a Life (Simon & Schuster), the musical play hilariously, passionately, and poignantly takes us from a conflicted childhood in Bible-Belt Oklahoma to the dizzying roller coaster ride of a life in show business to the fulfillment of the impossible dream of fatherhood, culminating in the lessons of a life well lived. Well . . . lived. HAM: A Musical Memoir is directed by Tony Award-winner Billy Porter and musical direction is by acclaimed pianist and composer Todd Schroeder. There will be two preview performances on Thursday, January 21 at 8pm and Friday, January 22 at 8pm, and opening is set for Saturday, January 23 at 8pm. The regular performance schedule is Friday and Saturday at 8pm and Sunday at 7pm through February 7. The Los Angeles LGBT Center’s Renberg Theatre is located at 1125 N. McCadden Place (one block east of Highland, just north of Santa Monica Boulevard), in Hollywood, 90038. Free onsite parking is available. PHOTO: SAM HARRIS. PHOTO BY TIMMY BLUPE. The much admired and acclaimed Critical Mass Performance Group has announced the world premiere of its newest work, Ameryka, written and directed by Nancy Keystone in collaboration with the company. Ameryka will play for five weeks only with one preview performance on Friday, February 5 and opening on Saturday, February 6 at 8pm. 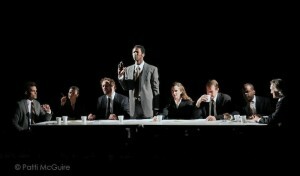 Ameryka will run through March 6 at Shakespeare Center of Los Angeles. The cast will feature (in alphabetical order) Curt Bonnem, Russell Edge, Ray Ford, Lorne Green, Drew Stafford Harper, Danielle K. Jones, Christopher Salazar, Nick Santoro, and Valerie Spencer. Charting a course through 250 years of astonishing connections between the United States and Poland, Ameryka is an epic exploration of the universal human longing for freedom and justice. From the American Revolution to the global war on terror, from the struggle for civil rights to the fight against communism, Ameryka turns history inside out in an unforgettable examination of the promises and betrayals of democracy. The story is told through Critical Mass Performance Group’s signature, kaleidoscopic style of found texts, heightened physicality, music and spectacle. The scenic design is by Nancy Keystone, lighting design is by Jeremy Pivnick, and original music and sound design is by Randy Tico. The stage manager is Julia Colbert Ruiz. Critical Mass Performance Group is a Los Angeles-based collaborative ensemble that has been developing new works and adaptations of classic texts since 1985. Known for its exuberant theatricality and historical-poetical subject matter, the ensemble was named 2013’s Best Theatre Company by the LA Weekly. Alcestis was developed at the Getty Villa Theatre Lab and premiered at Theatre @ Boston Court in 2013. Named in 10 Best Plays by LA Weekly, the production won a Best Adaptation Award from the LA Drama Critics Circle, the LA Weekly, and Arts In LA, and was nominated for best direction, sound/score, production design, choreography. Apollo, an epic trilogy exploring the US space program, its relationship with Nazi rocket scientists, and the surprising intersection with the Civil Rights Movement, premiered Parts 1 & 2 at the Kirk Douglas Theatre in 2005, won a Garland Award for Best New Play, and was named in the Top 10 Plays of 2005 by LA Alternative Press. Part 3 premiered with the full trilogy at Portland Center Stage (Oregon) in 2009. The Akhmatova Project, a movement-theatre piece inspired by the life and work of Russian poet Anna Akhmatova, was named one of the 10 Best Productions by the LA Times, received four LA Weekly Award nominations including Best Production, and won for Best Choreography. Other recent Critical Mass projects include Bread (2011), a site specific interactive performance-salon, commissioned by Cornerstone Theater Company, and Nancy Keystone’s adaptation of Antigone at Portland Center Stage in 2001. There will be one preview performance of Ameryka on Friday, February 5 at 8pm and opening is set for Saturday, February 6 at 8pm. The engagement will run through March 6 only with performances on Friday and Saturday at 8pm and Sunday at 2pm. There will be added performances on Sundays 2/14, 2/21, and 3/6 at 7pm, and on Mondays 2/22 and 2/29 at 8pm. Admission on Friday, Sunday, and Monday is $25; on Saturday it is $30. Student and senior discounts are available at all performances. Tickets are available online at http://critical-mass-performance-group.ticketleap.com/ameryka/ or by calling (323) 993-7263. Shakespeare Center of Los Angeles is located at 1238 W. 1st Street in LA, 90026. This classic American musical is one of my absolute favorites! The original Broadway production of Guys and Dolls opened in November 1950, ran for 1200 performances, and won five Tony Awards including Best Musical. 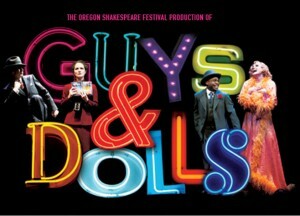 A little remembered fact: Guys and Dolls was selected as the winner of the 1951 Pulitzer Prize for Drama but because of book writer Abe Burrows’ troubles with the House Un-American Activities Committee the Trustees of Columbia University vetoed the selection and no Pulitzer for Drama was awarded that year. Not the finest moment in American history. Through the years there have been countless revivals and new productions of the show in the US, London, Australia, and around the world. I was lucky enough to see the 1992 revival on Broadway — an evening of theatre I will never, ever forget. That production ran for 1143 performances (only 57 less than the original!) and won the Tony Award for Best Revival. Pretty amazing history for a Broadway musical. The critically acclaimed Oregon Shakespeare Festival production of Guys and Dolls arriving at the Wallis this month follows their celebrated version of Into the Woods which I found extraordinary (and ITW is a show I had never really ‘gotten’ before). Directed once again by Tony Award-winner Mary Zimmerman, this Guys and Dolls promises to be another unforgettable theatre experience! For tickets and show times for Guys and Dolls, click here.